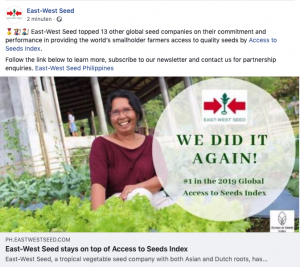 East-West Seed, a tropical vegetable seed company with both Asian and Dutch roots, has maintained its top position in the recently launched Access to Seeds Index. Access to Seeds, an independent organization funded by the Bill and Melinda Gates Foundation and the Dutch government, yesterday announced the results of its Global Seed Index from its Amsterdam headquarters. This brings four straight #1 rankings for the Asia-based company, sustaining its good performance in 2016 when the first Seed Index was released and where East-West Seed led the pack in the Global Vegetable and East Africa indices.